Thank you to everyone who voted in our poll to choose the name of our exciting new space. The winning vote was for Committee Central with 44% of students voting for this name. In the meantime, the building work has officially started and the University have been busy removing the asbestos and some of the existing walls. The pictures show progress and ideas for new space. Additionally, our Facilities team have been working on an initial design for the area and you can see an updated floor plan below. The new space is going to look brilliant and encompasses some meeting areas, lounge space and retains the SU Finance Office. 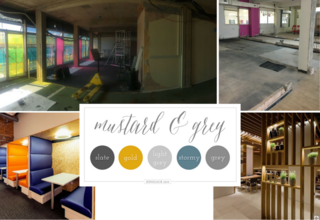 The suggested colours for the area are in keeping with feedback from students who said they wanted a cosy, neutral and inviting space. It is likely that the new space will not be available until the end of October so please take the time to let us know what space your committee will need during semester one. You can keep up to date and give feedback here.